If you have dry skin, is your makeup foundation giving you the flawless appearance you want? If it’s caking up, flaking off, sinking in too much, or making your skin oily, you need something different. You need one of the best foundations formulated specifically for dry skin. To help your skin look younger and feel healthier, it’s important to include other steps before you apply foundation. Exfoliating removes dead skin so moisturizers and makeup can hydrate your face better. And even if you use a BB cream or tinted moisturizer, don’t skip applying your own sunscreen or moisturizer to keep your skin hydrated. You may also benefit from using a primer or serum under your foundation. 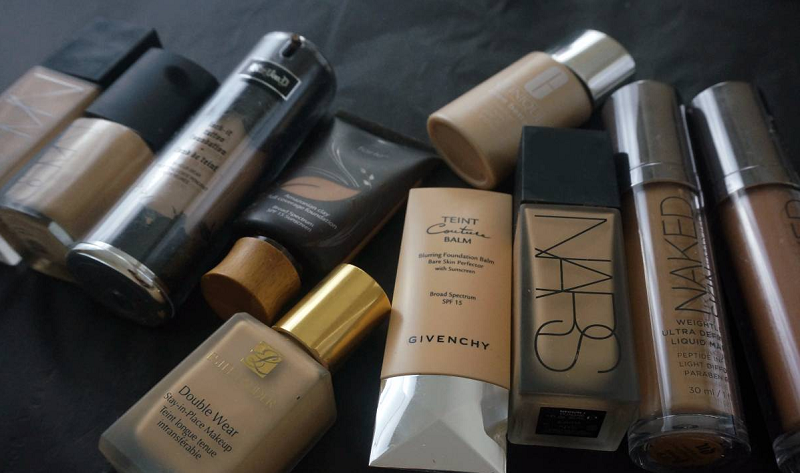 Let’s take a look at the best makeup foundations made for dry skin. These foundations range from sheer to full coverage. They are designed to help dry skin look renewed and flawless. Revlon’s Age Defying Makeup is made for older users who want to look in the mirror and see younger skin. The formula encourages collagen growth to firm up skin, and it’s hydrating, too. The SPF 15 protects against damage from the sun. Users say it hides fine lines and imperfections, and is very blendable and smooth. Elizabeth Arden’s Flawless Finish moisturizes skin for up to 24 hours even after you take it off. It feels light on skin but builds up to full coverage to make your complexion look perfect. Chanel’s Vitalumiere Aqua Light adds a radiance to your skin while it hydrates all day long. It has a lightweight sunscreen with SPF 15. Users say once they’ve applied it, they don’t feel like they have anything on at all. M.A.C.’s Face & Body Foundation is sheer and buildable without becoming cake-like. It comes in 13 shades to match most skin tones. The formula has emollients to lock in moisture for all day wear. Chantecaille’s Future Skin Gel Foundation is refreshing and lightweight. It contains seaweed to encourage skin to stay dewy fresh all day long. The formula has a matte finish with buildable coverage. Tarte uses the power of passionfruit and minerals to hydrate extremely dry skin and provide a flawless finish all day long. Hourglass Veil Fluid Makeup is packed with moisturizing and anti-aging ingredients like hyaluronic acid and their own Matrixly formula that smooths out fine lines and shrinks wrinkles. It has no oils, no artificial fragrances, no parabens, no phthalates, and no dyes that could irritate sensitive skin. If your skin is typically dry, but sometimes you suffer with an oily T-zone, try Clinique’s Even Better Makeup. It evens out skin tone without becoming cakey. It hydrates without causing more oiliness. Revlon’s ColorStay Makeup foundation is designed to keep your face looking great for up to 24 hours. It has a satiny finish with full coverage. Users say that it really does last all day long without melting. The formula has hyaluronic acid to draw moisture into skin, plus SPF 20 to protect from UV rays. It comes in 13 shades. Maybelline’s New York Fit Me! Foundation is made to help people with dry skin look dewy fresh all day long. It’s hydrating and healing to dry patches. The coverage is sheer to medium and it feels light on skin. It blends well and doesn’t highlight wrinkles. COVERGIRL and Olay combine forces to create the Tonerehab Foundation. It has Olay’s hydrating serum and COVERGIRL’s medium-weight coverage that hides fine lines and discolorations. It’s made for all day wear. The Smoothers Hydrating Makeup from COVERGIRL lasts up to 11 hours with light to medium coverage. Many users say it leaves their skin soft and even helps heal dry patches. It comes in 7 shades. Yes, it has a wand because it works like magic. The Neutrogena Hydro Boost Tint is a creamy smooth foundation that comes with its own applicator wand in the jar. Users say it covers up imperfections and leaves their skin feeling soft without causing breakouts. No list of foundations would be complete without one from Smashbox. The 15 Hour Wear Hydrating Foundation keeps dry skin happy without clogging pores or causing a breakout. It has full coverage and fans from 15 to 55 years of age. Made in Japan, the Maifanshi Aqua Foundation from Koh Gen Do is treasured by users with dry skin. It’s super-hydrating and full of minerals. It has the consistency of a sheer liquid, but gives medium coverage—plus, it’s buildable. The formula does not contain mineral oil, petroleum derivatives, synthetic fragrances, or parabens, so it’s gentle to sensitive skin. The titanium dioxide and zinc oxide provide some sunscreen as well. Boots No7’s Luminate Foundation has a SPF 15 sunscreen plus a pro-retinol complex. Ordinarily, it’s not recommended to spend time out in the sun if you’re treating your skin with retinol or Vitamin A. But if you don’t spend much time in the sun, you may appreciate this hydrating and skin firming formula with medium to full coverage. Sonia Kashuk’s Perfecting Luminous Cream gives lightweight coverage for all day wear. It hydrates dry skin with amino acids and urea so it can actually heal flaky, cracked skin. Almay Age Essentials is targeted toward middle-aged and older adults, but anyone with very dry skin will appreciate its benefits. Besides SPF 15, it offers medium-weight coverage to make your face look smooth and radiant. It can hide fine lines and uneven skin tone while it moisturizes with collagen, peptides, and hyaluronic acid. It comes in 9 shades that last for all day wear. L’Oreal Paris lasts up to 24 hours on your face. It offers medium coverage to hide minor imperfections and blemishes, plus it protects from UV rays. Long wear makeup doesn’t always hydrate skin, but in this case, users report success. Women with dry skin say the Infallible leaves their faces looking flawless all day long. It doesn’t cake up and it goes on smooth. Hyaluronic acid is a natural component that your body makes on its own. Unfortunately, the amount of it in your body lessens with age. It’s essential to renew dry skin because hyaluronic acid attracts water into skin cells. It plumps up your skin and makes feel soft and look smooth. It’s also an antioxidant that helps reverse signs of aging. Many cosmetic products contain hyaluronic acid because it’s very gentle to even very sensitive skin. Vitamin C, green tea, and caffeine are all antioxidants. They fight wrinkles, age spots, and even cancer because they protect cells from environmental damage. With too much sun exposure or pollutants in the environment, your body creates harmful molecules called free radicals. The antioxidants neutralize the free radicals so they don’t damage elastin, collagen, or your DNA. Some antioxidants, like Vitamin C, are powerful enough to fade skin blemishes while they repair cells. With dry skin, you need to encourage your skin to soak up water. You need humectants like glycerin, niacinamide, and urea. Niacinamide, or Vitamin B3, can help diminish redness in skin. For vegans, watch for vegetable glycerin. And yes, urea is related to waste products, but it’s used for treating skin conditions like psoriasis and eczema because it’s very good at rehydrating skin. Some of the most common emollients in cosmetics and skin care products are shea butter, argan oil, jojoba oil, and coconut oil. They lock in moisture to keep skin plump, fill in fine lines and fade wrinkles, and make it feel soft. Because you don’t want to look like you just rolled out of bed, but you also don’t want to spend an hour in the bathroom. Bobbi Brown’s Tinted Moisturizing Balm protects against sun damage and adds hydration with natural plant oils. The formula is medium-coverage and it hides fine lines. bareMinerals doesn’t only sell powders. Their Complexion Rescue Cream provides sheer to medium coverage to even skin tone and make skin look radiant and soft. Older users are especially fond of this formula because it does a great job of hydrating skin to turn back the years. NARS combines SPF 30 protection from UV damage with a super-hydrating tinted moisturizer, so this can be an all-in-one product for those who prefer less fuss in the morning. The tint brightens skin tone and hides redness, but won’t be enough to hide serious blemishes. There are no oils or synthetic fragrances in the formula, which pleases users with sensitive skin. The Kopara and seawater work over time to help dry skin recover its vitality. theBalm’s BalmShelter may be a tinted moisturizer, but it has better coverage than most brands do. It gives a smooth, even-toned finish but feels very light. Choose from one of seven shades. You can turn back time with these treatments. It may take a few days or even a few weeks, but you will see results from your tender loving care of your skin. Carry this refreshing spray with you to renew your skin in the afternoon. Enjoy a burst of organic freshness on your skin. The Juice Beauty Hydrating Mist uses rosehip, ylang ylang, and resveratrol from grapeseed oil to hydrate your skin. Spritz on a little to maintain that dewy fresh look. Apply the Eau Thermale Avène Rich Cream at night so you can wake up with renewed skin in the morning. Want to get immediate results from a hydrating face mask? Try Vichy’s Quenching Mineral Facial Mask. It only takes 5 minutes to elevate your skin’s moisture levels for the whole next day. Dry skin, whether it’s normal for you or a temporary condition, can still look great. We hope that we helped you find the ideal foundation for your face. Come visit us again soon to see new reviews of the best in skin care and beauty products.